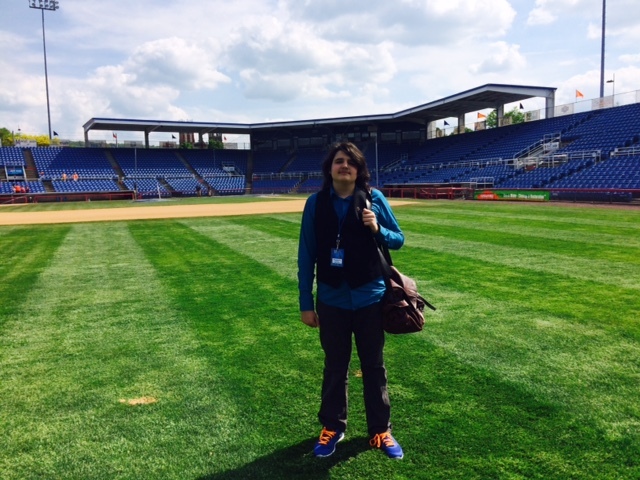 BINGHAMTON NY – Today, I went on up to NYSEG Stadium in Binghamton, New York, to watch the New Hampshire Fisher Cats (Blue Jays AA) battle the B-Mets (Mets AA). As you may know, the B-Mets are coming off a very successful year, in which they won the Eastern League championship. I arrived in Binghamton at around 11:45 am, and took my position in the cozy B-Mets press box, and looked at the green field, with the beautiful mountainous background. Only Spring Mobile Ballpark in Salt Lake City has better views. For those who have never been to the Binghamton Mets stadium, let alone the press box, the first thing you will notice is that everyone greets you with a smile. This might not sound like the biggest thing, but compared to other stadiums around the leagues, Binghamton has top notch staff. I had a great discussion with Binghamton Mets GM Jim Weed, a high-class individual who in 2011 was named the Mets minor league executive of the year. 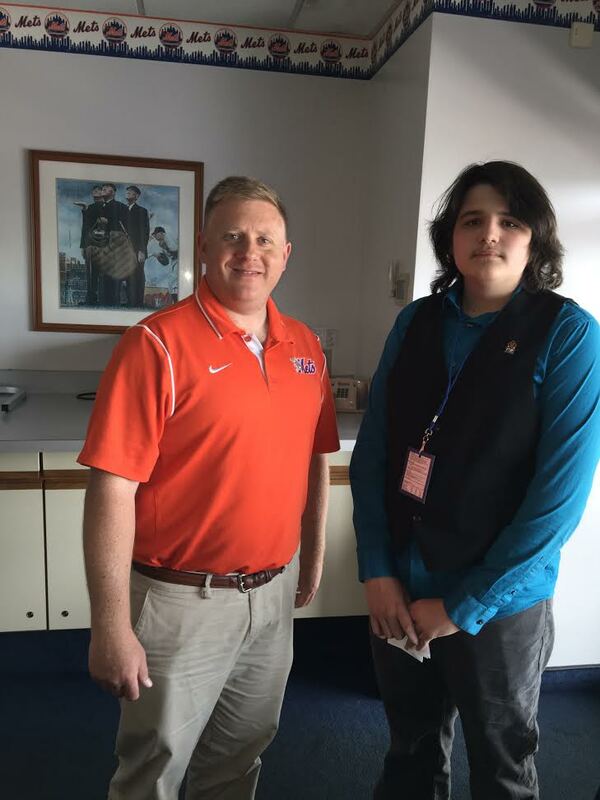 Here is Jim and I near the B-Mets press box. Now, on to the game: Seth Lugo started for the B-Mets, and it’s fair to say that he was in control all game long. Lugo pitched seven great innings, striking out six. The game was scoreless for seven innings, and progressed very well. One thing you should notice if you ever head on to a AA or AAA ballpark is the new pitch counts that are in play. After each pitch, they count down from twenty seconds. Let me be the first to tell you that these things never come in to play, never. If the pitch clock gets to eight seconds, I would be surprised. Lugo was removed after seven innings, and the subsequent pitchers did not fair well at all. They ended up giving five runs total, all because of one out walks. Walks always tend to hurt you in the end, and it cost the B-Mets the game. The B-Mets fell to 21-16, while the Fisher Cats earned a series split and improved to 18-19. For more on the B-Mets, read this column by B-Mets beat writer Lynn Worthy, one of the best in the business. Special thanks to William Maines, Lynn Worthy (and his wi-fi) and above all Jim Weed.